Capcom's Dead Rising started with the simple, but satisfying premise of using anything at hand to kill an seemingly endless supply of zombies, but included a few gameplay elements that tended to get in the way of the fun. The photography made sense given the main character, but never really came together the way it should, and getting side quests via radio made sense, but the damn thing never shut up, forcing many players to just ignore the thing. Then there was the issue of a single save slot. Dead Rising 2 keeps the zombie killing, but ditches most everything else in favor of making said slaying of the undead more enjoyable. There's also a deadly teddy bear, but we'll come back to that. Dead Rising's star, Frank West, sits this one out; our hero this time around is motocross star Chuck Greene, who has come to the Las Vegas-like Fortune City to compete on a game show called "Terror is Reality" in hopes of winning enough cash to buy Zombrex for his daughter. If taken daily, Zombrex will keep the zombie virus at bay, but naturally, it's not cheap. A zombie outbreak occurs while Chuck is in Fortune City, and he has to survive for 72 hours until the military can get there. The three-day time period is a carry-over from the original Dead Rising, but thankfully, this time around you'll have three save slots and more opportunities to save, which should help mitigate some of the incredible frustration the first game caused. There are still survivors to rescue and other side quests, but your radio won't be quite so obnoxious, or so I'm told, anyway. I remain skeptical until I have more time with the game - anything is bearable in ten-minute increments, which is about all the time I had with it. Dead Rising offered you an entire mall's worth of stuff to hurl at your undead attackers, but all of Fortune City is at your disposal in Dead Rising 2. If you can find it in Las Vegas, it's probably in Fortune City, so you'll have plenty of items on hand to use as weapons. Chuck's also pretty handy with the duct tape, and will be able to combine objects to make new and more deadly weapons. Attach a drill to a bucket and you've got a hat that bores a hole in a zombie's head. Meanwhile, machine gun + teddy bear = Freedom Bear. Not just any old combination will work, though; items that can be tinkered with will have a wrench icon over them. You can either try slapping stuff together at random, or locate one of the recipe cards hidden in the game to learn what goes with what. 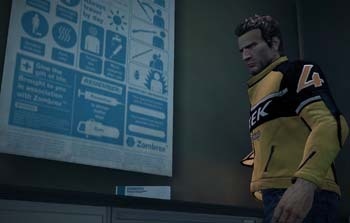 Dead Rising 2 will also feature online drop-in co-operative play. Use the in-game transceiver to call your buddy for help, and once they accept, they join your game. PlayStation 3 owners, prepare to be annoyed: A Dead Rising 2 prologue, called Dead Rising 2: Case Zero, which takes place about three years before Chuck's trip to Fortune City, will be exclusive to Xbox 360. All of the player points and stats earned in the prologue carry over into the main game, as well, meaning 360 owners can start Dead Rising 2 with as much as a Level 5 Chuck. Dead Rising 2 is due for release on Xbox 360, PS3, and PC this Fall, with the prologue coming to Xbox Live a few weeks before the game.